On Sunday Babs sent her weekly Michigan Pic. She wrote: This foxy lady is sitting in the middle of Torch Lake looking for her partner who is closer to the west side, the best side. And as of today Torch Lake is frozen as far as I can see. This was Saturday. Then Babs sent a link to a YouTube video, What does the fox say? I am a trusting soul, particularly when it comes to whatever Babs gets up to, so I included the link for you, even though I am At Home and not able to see it for myself. I did, however, do a quick search . . . and now we all know just how far Out of Things I am. I had not even heard of Ylvis. My ears are pinned back in wonder and amazement. I am unlikely to understand anything about popular culture for the foreseeable future. Fortunately I have Babs for that. Also Wikipedia (The Fox). I’d not heard of Ylvis or “What does the Fox Say?” either. I got 50 seconds in before I put an end to all that and came back to just look at Babs’ photo. It’s a wondeful photo, and not nearly so…. I’m looking for a word…. Oh dear, that bad, eh? When you find the word I will be interested to know what it is. I am always looking for words myself. I may be looking for quite a few after I see the video for myself. I was Ylvis ignorant too and surprisingly contented to be so. However a new experience is always welcome so thank you. You know, I find that there is a good deal of popular culture – we need a new word for that. Popcult? Yes. There is a good deal of Popcult that I am contented to ignore. Television, for example. Ah well. 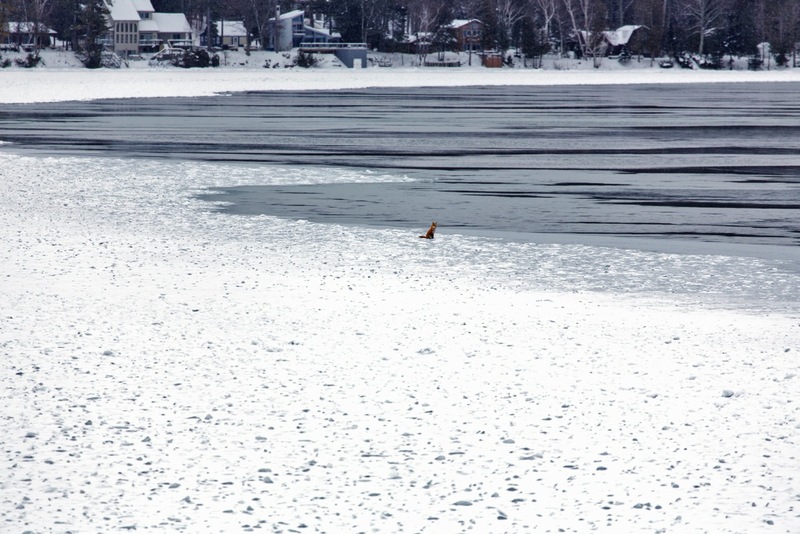 At least we have the lovely fox herself, guarding Torch Lake against rodents large and small. The picture of the fox is beautiful and Babs has come through once again. Somehow red in winter always looks better – like a cardinal on a frozen branch. Maybe I am too old, but the video link (what does the fox say?) didn’t click for me. There is a surprising amount of unanimity here. Fox by Babs, good. Video by Ylvis, not so much. I can hardly wait to see if I’m too old too. I usually am. Ooh-ooh, can I be first? Love finding you again and again, Gerry, and seeing Babs and seeing the little fox! PJ you are always first whenever I think of Leelanau County, which I have been doing all day. However . . . I published the post and took off for a nice walk with the dogs. When I got back there was a comment queue awating moderation. I am very glad you liked the little fox. I thought she was very pretty too. Unfortunately, I have heard the video. The word “inane,” (among others) springs to mind. On the other hand, the pictured fox waiting for her mate is charming. Babs has a way with a camera that produces lovely results. If I say your post went from the sublime to the ridiculous, I’m sure you’d have no trouble assigning each adjective to its appropriate noun. I’m glad that “inane” was the word that sprang to mind. I was beginning to worry that it might be something like “Eewwww.” Actually, I haven’t finished worrying. Working in a middle school, I am more than familiar with what the fox says, lol. It became a kind of funny joke at my school – one team of 8th grade teachers dressed up in fox masks on Halloween in honor of it all. I, um, actually like middle school students. I don’t have the energy for a whole classroom full of them–teachers are astonishing people!–but I do enjoy spending time with them in smaller groups. We don’t expect each other to be all the same, and we’re always surprising each other. No need to worry Gerry…a bit of a silly video but nothing horrible. Pretty photo though! Isn’t that a pretty fox? I’m glad I won’t have to wash the Cowboy’s ears out with soap. The video’s lyrics will make you want to weep, Gerry, truly they will. I think they were written by first-graders. I tell you, I started out to write a little family-oriented blog about the doings in a small township and the next thing you know I am floundering around with issues of banned books and tragic videos. Life is an interesting journey, particularly when a person’s navigation system is a degree or two off kilter. I didn’t think it was tragic. It made me want to get up and dance. That was Miss Sadie’s take on the whole thing too. She is out spin-dancing on the deck as we write, practicing for the day when she can star in her own video: What does the terrier say?